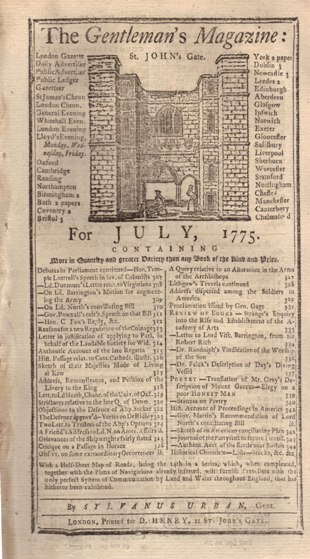 This July 1775 issue of Gentleman's Magazine is chock full of exciting news of the developments in the American colonies with the most historic being the full report of British General Gage of the Battle of Bunker Hill, the first full scale military engagement of the Revolutionary War, the War for American Independence. While the British forced the American forces under General Israel Putnam from the field on June 17, 1775, the British suffered their greatest casualties of the war and the rebels proved they were willing to stand up to seasoned British regulars. The British action also did not stop the siege of Boston by the colonial militia which lasted until the Americans moved the cannons seized from Fort Ticonderoga to Dorchester Heights, which made the British occupation of Boston no longer tenable. Below are pictures and descriptions of some of the other notable contents of this issue. 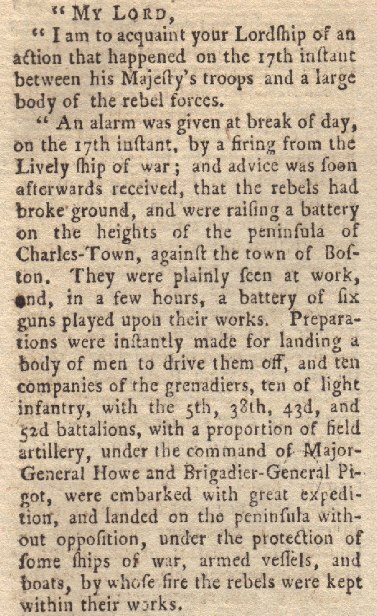 The first pictures shown below are of two excerpts from Gen. Gage's report of the Battle of Bunker Hill. Below is the index of this historic issue which shows the heavy emphasis on American matters. 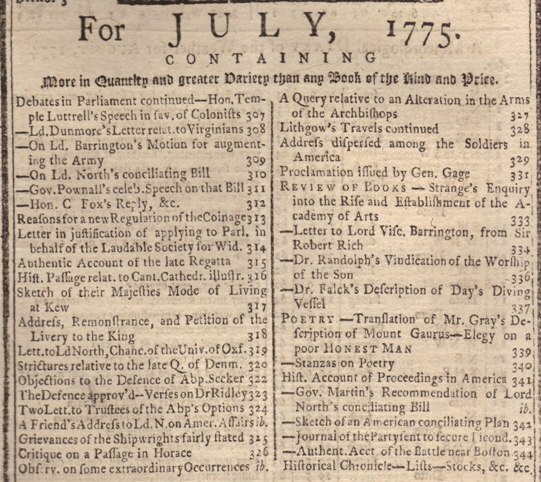 The Parliamentary debate referenced in the top right was primarily concerned with the British Prime Minister, Lord North's "Conciliating Bill" that would let the American colonies tax themselves. 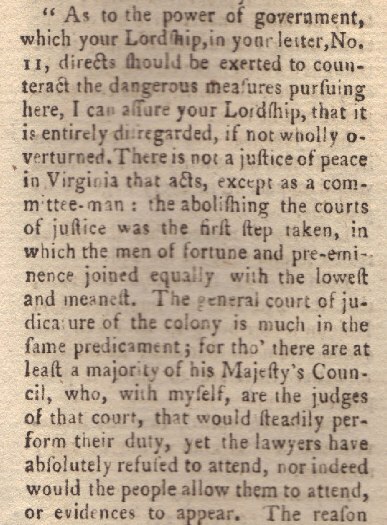 Documents such as Virginia Governor Lord Dunmore's letter to the British ministry were submitted to Parliament by Lord North and are referenced in this section. The Bunker Hill report is referenced on the bottom right, on page 344. The volume text is complete and in fine condition as shown by the pictures, but the British fold out road map called for is incomplete. 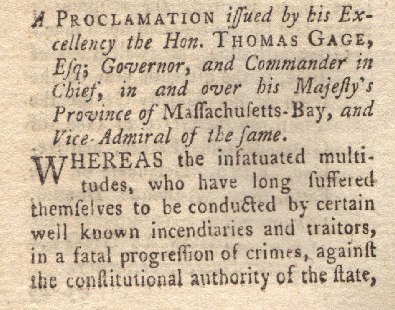 Also in this issue is General Gage's proclamation of June 12, 1775 (shown in part below) demanding that the rebellion stop and that everyone turn in their weapons, in which case he would pardon them. 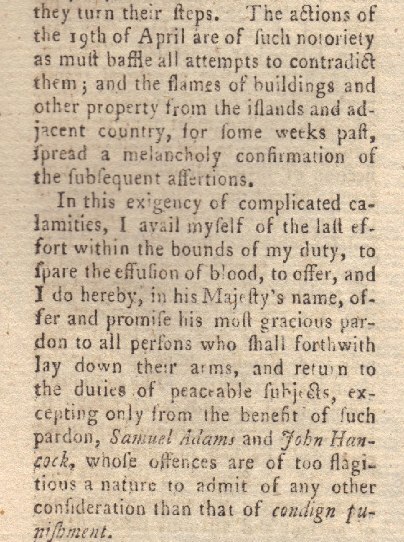 But that offer of a pardon did not extend to John Hancock and Samuel Adams, "whose offenses are of too flagrant a nature to admit of any other consideration than that of condign punishment." 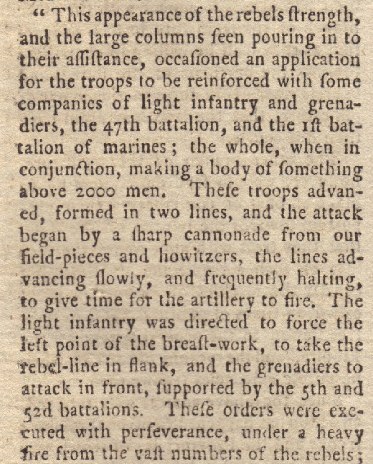 The Proclamation obviously had no effect, because five days latter the American's invested Breed's Hill with fortifications and cannon and the British were forced to try to remove them in the Battle of Bunker Hill. 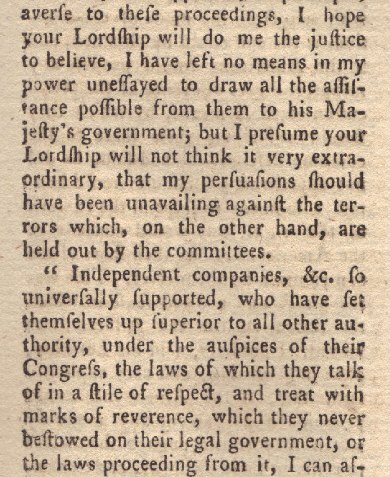 Virginia's colonial Governor Lord Dunmore has a number of entries in this issue, the most revealing of which is the portion pictured below where he admits to the British ministry that he has completely lost control of the government in Virginia. Later in this issue there is a further report of an insurrection led by Patrick Henry after Governor Dunmore seized gun powder from the militia armory in the capital of Willamsburg, with the result that "a company of volunteers, to the number of 150, suddenly armed themselves, and with Patrick Henry, Esq. (one of the Delegates elect to the general Continental Congress at Philadelphia) at their head, made forced marches, and unexpectedly encamped in the neighborhood of Williamsburg." This caused the Governor to pay the rebels for the gunpowder and then hea nd his family skedaddled aboard a British Man of War on the James River. This is a great piece of contemporaneous American history reporting on great events shortly after they happened, many in full text form. The Battle of Bunker Hill and the loss of control of their American colonies must have been a great shock to the British and this is an important first report of those momentous events.